4 Trends Driving a Looming Credit Crisis in East Africa, Bennett Gordon and Ben Lyon. 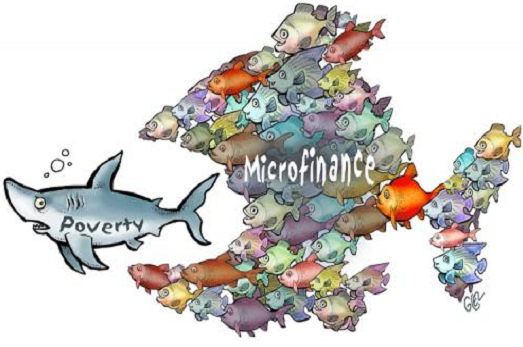 The microcredit model was created to help the poor escape poverty and deprivation. After initial hesitation, the World Bank became the most important advocate for the commercialised microcredit model. However, the microcredit model has possibly undermined the chances of sustainable and equitable development to create a poverty trap of historic proportions. Popularised in the 1980s by the work of future (in 2006) Nobel Peace Prize recipient, Muhammad Yunus, the microcredit model was seen as the most awe-inspiring local economic development model of all time. The disbursement of a simple microloan to the poor was seen as pure genius: it allowed the poor to become self-employed entrepreneurs en masse which, as Yunus claimed many times, would “eradicate poverty in a generation”. 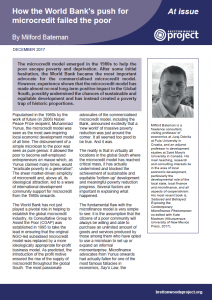 The sheer market-driven simplicity of microcredit and, above all, its ideological attraction led to a wave of international development community support for microcredit from the 1980s onwards. The World Bank has not just played a pivotal role in helping to establish the global microcredit industry, its Consultative Group to Assist the Poor (CGAP) was established in 1995 to take the lead in ensuring that the original NGO-led subsidised microcredit model was replaced by a more ideologically appropriate for-profit business model. As predicted, the introduction of the profit motive ensured a rapid rise in the supply of microcredit throughout the global South. The most passionate advocates of the commercialised microcredit model, including the Bank, announced excitedly that a ‘new world’ of massive poverty reduction was just around the corner. It all seemed too good to be true. And it was. The reality is that in virtually all locations in the global South where the microcredit model has reached critical mass, it has actually undermined and blocked the achievement of sustainable and equitable ‘bottom-up’ development and meaningful poverty reduction progress. Several factors are important in explaining what happened. The fundamental flaw with the microfinance model is very simple to see: it is the assumption that the citizens of a poor community will always be willing and able to purchase an unlimited amount of goods and services produced by those among them who have opted to use a microloan to set up or expand an informal microenterprise. Microfinance advocates from Yunus onwards had actually fallen for one of the most famous fallacies in economics, Say’s Law, the mistaken idea that supply creates its own demand. Yet, as the late Alice Amsden noted in her 2010 article, poverty in the Global South in recent times has not arisen because of an insufficient supply of the basic goods and services needed by the poor to survive, but because of the lack of purchasing power (effective demand) that is necessary for the poor to obtain these important things. This is why the bulk of microcredit clients either just about break-even, or fail in their attempt to set up a viable business. Struggling microenterprises, and especially outright failures, all too often lead to increasing and eventually un-repayable levels of debt for their hapless owners, but this deleterious development is conveniently overlooked by the microcredit sector, which naturally prefers to highlight only the tiny numbers of successes. At the same time, high microcredit-induced levels of new entry, and so jobs and incomes additionally created in new entrants, are largely offset by an equally high level of job and income losses incurred when incumbent microenterprises lose customers and are pushed out of the local market (termed ‘displacement’). In fact, a microcredit-induced increase in the supply of the simple products and services provided by informal microenterprises and self-employment ventures is most often associated with what has been termed the ‘job-churn’ phenomenon. In addition, the entry of new competitors assisted with microcredit often entails the loss of any collateral posted and other problems for the poor (such as forced migration to escape microcredit-induced debts). The additional poverty-push supply of simple goods and services also creates a hyper-competitive ‘dog-eat-dog’ local economy that inevitably pushes average incomes down and degrades working conditions. In post-apartheid South Africa, for instance, an increase in informal sector competition, stimulated by the increase in the supply of microcredit, was one of a number of factors behind a dramatic increase in competition that significantly decreased the incomes of incumbent informal microenterprises. From 1997 to 2003 a more than 11 per cent per year decline in self-employment incomes was registered, with real wages in the informal sector also falling by 7.8 per cent per year. When the evidence for short-run poverty reduction gains proved illusive, the World Bank began to promote an argument that, it hoped, would continue to justify support for the microcredit model. It proposed that helping start many more informal microenterprises would in and of itself catalyse local development. Microenterprise development would provide the ‘seeds’ required for longer-run sustainable development. This hypothesised evolution turned out to be myth. First of all, microenterprises generally do not serve as a ‘breeding ground’ for more productive formal Small and Medium Enterprises (SMEs). Almost all formal growth-oriented SMEs begin their life as formal SMEs, not as informal microenterprises. Second, informal microenterprises also seriously hinder important technology transfer and industrial upgrading processes. For example, large numbers of tiny retail outlets most often do not find it feasible to begin to mechanise, which greatly raises productivity, whereas a smaller number of larger retail outlets with higher volume do. Third, informal microenterprises are generally incapable of establishing crucial productivity-enhancing connections to other enterprises, such as through sub-contracting, clustering, networking and supply chain participation. Worst of all, the growth of needed formal productivity-raising SMEs is stunted by competition for markets and financial support from large numbers of informal microenterprises that do not pay decent wages, do not allow trade unions, do not pay local or national taxes, do not respect environmental legislation, and so on. This prevents the most productive enterprises from emerging and so inevitably traps the poor in the worst possible forms of employment in the informal sector. Thus, market share lost to the informal sector, even if only temporarily, immediately raises the formal sector’s costs, as well as frustrating its long-run potential for expansion and for making crucial technology investments. The potential to eventually provide much higher paying jobs in the poorest communities is therefore lost, and the poor remain trapped in the informal economy. Indeed, the World Bank’s own ‘Enterprise Surveys’ pointedly show for many countries in the global South that crucial financial support is swamping the unproductive informal microenterprise sector, and thereby effectively denying much financial support to the higher productivity formal SMEs. This trend inevitably results in the rapid expansion of the former and the gradual contraction of the latter. The resulting investment shortage affecting SMEs thus further helps to de-industrialise, informalise and primitivise the local enterprise sector. Many microcredit institutions have woken up to this awkward fact and, in order to both survive in the face of over-indebtedness in microcredit markets and to try to quietly repair some of the economic damage they have caused, are now openly shifting to provide more support for SMEs. The commercialised and deregulated microcredit model that emerged in the 1990s under World Bank/CGAP tutelage was very centrally premised on the understanding that it would always responsibly lend to the global poor. Sadly, commercialisation almost immediately created a wave of Wall Street-style “blowback” outcomes linked to reckless lending, fraud and profiteering. Another predictable outcome of the profit-driven microcredit model is that in almost all locations where it has gained a significant foothold, a destructive sub-prime-style microcredit meltdown has eventually been precipitated. Beginning with Bolivia in 1999 and then South Africa in 2001, after 2007 a quick succession of microcredit meltdowns created huge problems in Nicaragua, Bosnia, Morocco, Pakistan, Cambodia and, the biggest to date, in the Indian state of Andhra Pradesh. Bosnia is one of the worst examples of this phenomenon. World Bank financial and technical support to build the microcredit sector has been substantial from the conclusion of the Yugoslav civil war in 1995, initially taking the form of the $40 million Local Initiatives Project. However, little could be done to stop the rising over-indebtedness and the 2009 meltdown. Moreover, this destructive episode took place in tandem with a number of spectacular instances of fraud and egregious profiteering in the microcredit sector that were the inevitable outgrowths of the extensively deregulated environment demanded by the World Bank. Cambodia also saw a massive expansion of microcredit after 2009 thanks to a flood of foreign investment and technical support, including that provided by the Bank and its private-sector arm, the International Financial Corporation (IFC). The IFC has, rather opportunistically, made a major capital gain from taking an equity stake in ACLEDA, the country’s largest microcredit institution. Yet ultra-rapid growth driven by spectacular profitability has brought the sector to the verge of meltdown, and the Cambodian government has been forced into taking a series of aggressive and costly measures of late in order to limit the inevitable damage. The reality across the global South is that the microcredit industry and its investors now view the miserly earnings of informal microenterprises as a flow of funds that can be used to repay a growing supply of high interest rate microloans, thus allowing them to capture an increasingly large part of the economic surplus of a poor community. Such a debilitating scenario is probably not what the early pioneers of microcredit had expected to happen, but it has transpired nevertheless. With the microcredit model increasingly seen as having failed to resolve poverty, the World Bank began to mobilise in order to save it from collapse and developed the ‘financial inclusion’ agenda as the new answer to global poverty. With an abundance of research staff, lobbyists and programmes, the Bank proceeded to sell financial inclusion to the international development community and western governments. With little independent evidence, the World Bank nevertheless continues to vector enormous resources into promoting financial inclusion. One of the latest developments in the financial inclusion space, driven by the World Bank, but ably abetted by USAID acting on behalf of the biggest US financial and digital payments corporations, is the deployment of a range of IT and digital payments systems that increasingly include the poor in the local financial system. Marketed by the Bank as of enormous benefit to the poor, there are already worrying signs that this latest innovation will actually considerably add to their vulnerability and deprivation. For a start, even advocates accept that the simplicity in obtaining a new microloan and other trivial products and services via a mobile phone is going to extend the already pressing over-indebtedness problem in many countries, especially in Africa. For example, Kenya’s hugely publicised M-Pesa has already been shown to have had no impact on poverty and has begun to quietly move to significantly up the level of profit it extracts from its poor clients. A perfect example of what is likely in store for the poor comes from South Africa, where IFC-supported Net1 has used its contract to run the social grant system in the country to access data on clients. It then uses this data to market a range of additional products to its vulnerable clients, such as cell phone time, the payment for which is simply deducted from the social grant payment. The result has been a major rise in over-indebtedness and gradual loss of wealth by the poor, but very healthy profits for Net1. While South Africa’s civil society has been outraged by such exploitative practices, the World Bank sees no problem with this business arrangement. Indeed, even after the extent of unlawful and unethical practices had been made public, the IFC invested $107 million in Net 1 in April 2016. The World Bank saw in the microcredit model the potential to promote ‘a world without poverty’ through market forces and individual entrepreneurship, yet without disadvantaging the business and political elites upon which it draws its support. The reality, as noted by the World Bank’s Cull and NYU’s Murdoch November working paper, researchers have so far “failed to find sustained evidence that access to microfinance has writ large done much to reduce poverty, improve living conditions, and fuel micro-businesses.” Condemned to a life in the informal sector and deliberately stripped of any collective power and state agency to affect real pro-poor change, the global poor have been betrayed by the Bank and others that ostensibly spoke up on their behalf. The local financial system in the global South thus needs urgent change: it needs a reboot in the direction of community-owned and controlled financial institutions, such as credit unions, cooperative banks and municipal development banks, that by design lock-in the priority to promote sustainable development and equitably serve the poor, not simply maximise profit for a narrow spectrum of already wealthy supporters. 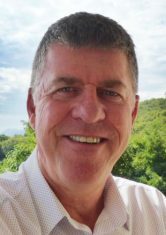 Milford Bateman is a freelance consultant, visiting professor of economics at Juraj Dobrila at Pula University in Croatia, and an adjunct professor in development studies at Saint Mary’s University in Canada. His main teaching, research and consulting interests lie in the area of local economic development, particularly the developmental role of the local state, local finance and microfinance, and all aspects of cooperativism. His most recent book is, Seduced and Betrayed: Exposing the Contemporary Microfinance Phenomenon co-edited with Kate Maclean (Albuquerque: University of New Mexico Press, 2017). Bateman, M. Confronting Microfinance: Undermining Sustainable Development, 2011. (Ed), Sterling, VA: Kumarian Press. Nightingale, P., and Coad, A. (2014). Muppets and gazelles: Political and methodological biases in entrepreneurship research. Industrial and Corporate Change, 23, 113–143.